This is a moon goddess theme coordinated web set page. I suggest using this pale gray colored text as shown. The "wisdom" personified by a moon goddess is often an expression of the science of astrology in which the observation of the moon's phases is so important a factor. The tendency to centralize the powers of the universe leads to the establishment of the doctrine of a triad often personified by the moon, the sun, and the earth as creation's life-force. 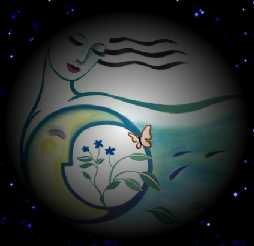 Above is a blank moon-goddess title graphic for you to insert a web page title on. If you don't have a graphic program capable of doing that, e-mail me and I will do it for you as time allows. Below you will find the lunar graphic divider and butterfly bullet designed for this page. The crescent moon buttons designed for this page also are linked for this site so that you can navigate through it. All of the clip art elements can be found in the downloadable .zip file below. The moon does not represent any deity in Chinese culture. The moon is a palace where immortals and fairies live. Chang'e, Ch'ang-O or Chang-Ngo, also known as Heng-E or Heng-O, is the Chinese goddess of the moon. Unlike many lunar deities in other cultures who personify the moon, Chang'e only lives on the moon. Góntia (Guntia, Candida, Fortuna), was a Celtic moon goddess; her name comes from the Welsh word canda (shining white) and the Celtic condate (confluence). She was said to bring good luck. In Greek mythology, Selene (meaning "moon") was an ancient lunar deity that eventually largely supplanted by Artemis. The name is the root of selenology, the study of the geology of the Moon. In Hinduism, Anumati is a lunar deity and goddess of wealth, intellect, children, spirituality and prosperity. Also Anumati is a type of full moon day in which the moon remains slightly cut and not fully full moon. Type used for buttons called "Harrington." To save, you may download the .zip file which includes the moon goddess graphics, clip art, instructions and HTML template. Do not link to the graphics on this page! Please note that this set is free to use on personal websites only (donations are always appreciated). Those sites that hope to generate income (business site) there is a one time $10 minimum requested donation payable through Pay Pal. Moon goddess web theme set courtesy of: Crystal Cloud Graphics.